Penn and Hughes have battled thrice in the past. In the past they were opponents, now they are training partners. For B.J. 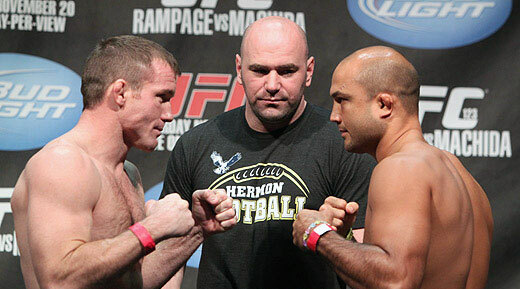 Penn, Matt Hughes is the best training partner to prepare for his battle with Jon Fitch. Penn and Hughes battled thrice in the past. Their rivalry dated back 2004 when Penn was at the welterweight division and defeated Hughes at UFC 46. Last November, Penn won again via K.O. against Hughes at UFC 123 ending their trilogy. However, when it comes to preparing for his upcoming UFC 127 fight, he depends on the man who used to be his greatest opponent. “I texted Matt a few times, and I didn’t know what kind of response I was going to get. He texted later and Matt ended up saying, you know what, I’m in,” explained Penn. “I had a great time training with Matt. It really upped my confidence,” said the former UFC lightweight and welterweight titleholder. UFC 127 takes place at Acer Arena in Sydney, Australia on Feb. 26. The welterweight showdown between Jon Fitch and B.J. Penn headline the UFC’s second trip to Australia.